Brand New Turquoise Blue 12mm Lizard Grain Leather Watch Band that fits the Mini Philip Stein Watches. Including but not limited to the Philip Stein mini, Philip stein Mini Double Diamond, Philip stein Mini Pave, Ect. Our bands are about 8 inches long including the Buckle. 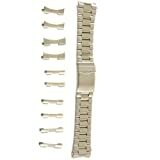 We do add an extra two holes to accommodate for every size wrists!Each watch band comes with built in Speed pins (quick release pins), so you will not need any extra tools to use this band! Band comes with 100% stainless Steel hardware.With Built in Speed pins, feel free to add a little class to your watch in only a few seconds!Email us if you have any questions!